In some ways it’s impossible for me to give this show an objective review. I watched many episodes when I was in high school, then re-watched the entire series a few years ago, and subsequently watched the entirety of Next Generation, Deep Space Nine, and Enterprise as well. 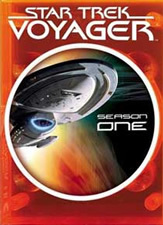 But going back and re-watching Voyager has, in some ways, actually helped me be more critical in reviewing it. 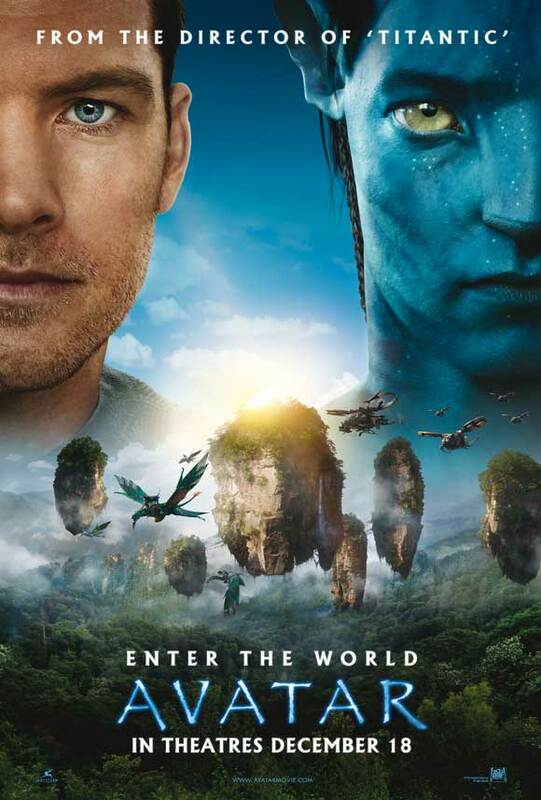 Having a much greater perspective than I did a few years ago, with respect to science fiction and the Star Trek universe overall, I am actually enjoying the show far more than I originally did. In fact, even more than Deep Space Nine, it is a worthy successor to the legacy left by Next Generation. But while it gets many things right, it also does not innovate in the same way that Deep Space Nine did, and while the show often feels fresh and interesting, it is also more iterative than innovative. Nonetheless, Season One got things off to a fairly good start despite some missteps, and laid some impressive groundwork for the seasons to follow. Voyager debuted on January 16, 1995, almost one year after All Good Things… and sci-fi fans, still wistful over the final voyage of Picard and Company, while also a tad angsty from the first few lackluster seasons of Deep Space Nine, were eager for a return to the single space-faring vessel concept pioneered by Gene Roddenberry decades earlier. And for better or for worse, Voyager in essence gave them exactly what they wanted: a lone ship of exploration, more or less seeking out new life forms and new civilizations, boldly returning from an area of space where no one had gone before. Having recently watched the exploits of Archer and his crew in Enterprise, a series with a big budget, top-notch special effects, but mediocre plotlines and forgettable characters, I was a little anxious at returning to Voyager. Would it hold up against the test of time, or would its scars show through as I had gained a more critical eye for these sorts of things over the years? 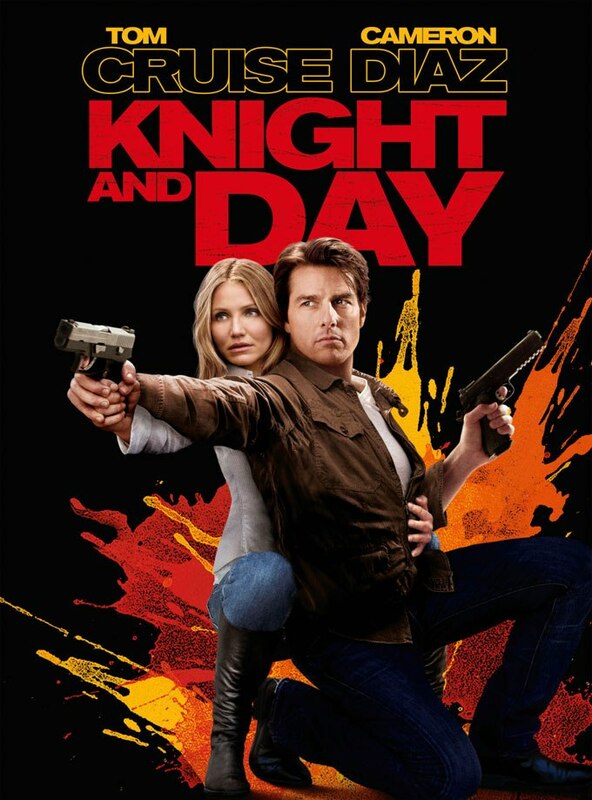 Returning to favorable times gone by is dangerous, as some movies and TV shows just don’t age well. But Voyager, surprisingly, remains as interesting, exciting, and even fascinating as it did when I was a wide-eyed 15-year-old kid watching the series premiere for the first time. 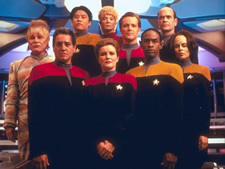 The crew of Voyager. And yes, it was difficult to locate a picture from Season One (i.e. without Seven of Nine). The basic premise for the show is fairly simple: Voyager, an Intrepid-class starship fresh out of spacedock, ends up on the other side of the galaxy and its crew, led by captainatrix Kathryn Janeway, gots to find its way back home. As (bad) luck would have it, a ship of Maquis, the closest thing Star Trek has to terrorists, are trapped out there with them and both crews have to not only share the same starship, but learn to work together and respect one another if they want to make it back home in one piece. 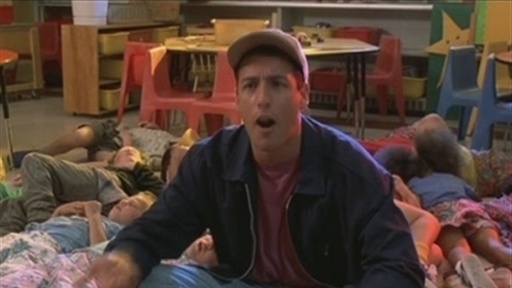 Sound like an after school special? 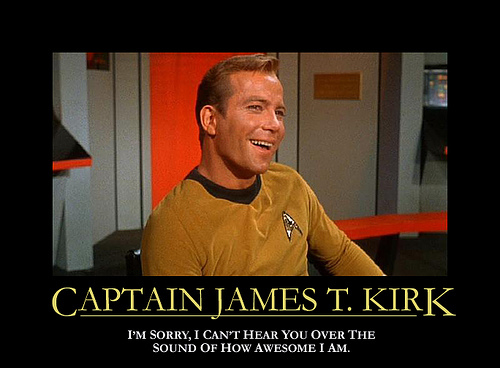 You bet, but such is the nature of the best of Star Trek–lessons about humanity wrapped in a cloak of space exploration and otherworldly aliens. Though Season One has its rough times, its focus remains primarily on what makes Star Trek, and all good science fiction, great: the characters, and by extension, the exploration of the human condition. When one strips away the special effects, what’s left is a group of interesting, though a tad contrived, individuals who must learn their place on the ship as well as their place in the world. 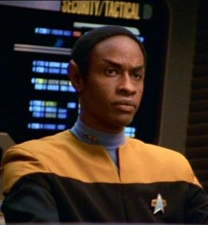 The mix of Maquis and Starfleet personnel on Voyager creates some compelling conflicts, particularly in the final episode Learning Curve, where several Maquis must learn to work within Starfleet rules while, at the same time, Tuvok, the rigid Vulcan security officer, learns there are times to bend the rules too. It’s this type of give-and-take that is vintage Star Trek, and it’s nice to experience it all over again. Vulcan Commander Tuvok: If you've got a problem, yo, he'll solve it. Series creators Rick Berman and Michael Piller took a bit of a chance with the captain of Voyager as well: after a storied tradition of alpha male captains, the decision to put a strong-willed female character in the captain’s chair was a bit daring but mostly successful. In fact, Janeway’s balance of tough-as-nails on-the-bridge persona with caring and sensitive ready room character is so successful, her femeninity all but ceases to be an issue by the end of the season. She’s a woman, sure, but first and foremost, she is in charge of a starship–and Berman and Braga wisely make that the central focus here. Along for the ride is first officer Chakotay, the leader of the motley Maquis crew; freewheeling helmsman Tom Paris; naive, wet-behind-the-ears Harry Kim; tough but brilliant half-klingon engineer B’elanna Torres; and a handful of supporting characters like Neelix, Kes, and the unnamed holographic doctor. At times the show feels like the characters were cobbled together in a focus group (“Ok guys, we need a womanizer, a ‘new guy,’ and a Klingon!”) but through their exploration of the Delta Quadrant the crew encounters enough situations to really give them a chance to interact, learn, and grow, and by the end they start to feel like a crew that really does work together and rely on each other. Where things get a bit rocky is the aliens, as the omnipresent villains, the Kazon, are more like paint-by-numbers Klingon ripoffs than a true alien race. Neelix, a Talaxian care-bear version of Han Solo and Kes, his sidekick Ocampa girlfriend, are picked up by Voyager but don’t really serve much of a purpose other than to be used as traditional Star Trek exposition sounding boards (Kes: “How does this weird space device work?” Starfleet Officer: “Good question! Let me explain it so you, and the audience, can understand!”) and to generally be annoying or get in the way. Neelix appoints himself Morale Officer, a title which only gets more embarrassing as time goes on, and generally exhibits a ninth-grade-level of possessiveness over Kes, which is thankfully dropped midway through Season Two. 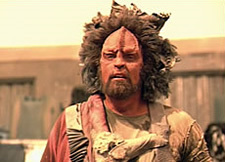 The Kazon...one of the dumber alien races to appear on Star Trek (and that includes the Gorn). The Vidiians are a bit more interesting, and post a more dangerous threat other than simply carrying a bigger stick, but still a far cry from Romulans, Cardassians, or even Ferengi. And really, if a captain is trying to get her crew back home, why does she stop to investigate every potentially dangerous and harmful space anomaly she finds? But then, a show in which nothing dangerous ever happened wouldn’t be all that interesting to watch, so I can overlook this a little. But only a little. The 16 episodes in Season One run the gamut from time travel, to alien encounters, to wormholes, to good old-fashioned murder investigations. There is also a bit of political intrigue thrown into the mix with the defection of one of the Maquis to the Kazon, and some soul searching when Torres is essentially separated into two individuals: one human, and one Klingon. But at the heart of nearly every episode is a focus not on the action, special effects, and harrowing space battles (yes, Voyager is all about the molasses-paced shield-draining phaser-based ship combat), but a focus on the characters. Almost every episode helps us get to know someone better, or shows us how a character overcomes an internal conflict, or gives us a bit of insight into what it means to be human. And for a show’s inaugural season, it’s hard to ask for much more.